The Duke of Sussex was speaking at an event marking the Prince of Wales's 70th birthday. 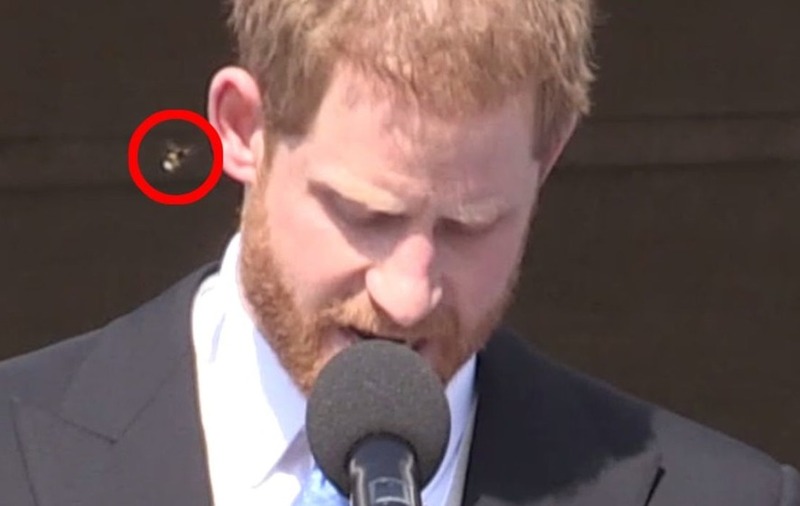 Being attacked by an insect is annoying enough, but when you’re the Duke of Sussex and you’re speaking in tribute to your father – well that’s really annoying. But Harry managed to turn a tricky situation to his advantage and, after some quick swatting to get rid of the pesky bee, had his audience and wife laughing with him. At first the bee swirled around his head and the duke ignored it, but when it buzzed close to his right ear he waved it off with his hand, losing his place in his speech. Harry was speaking during a Buckingham Palace garden party marking the Prince of Wales’s 70th year and more than 40 years of charitable work. The duke had begun to say “So, Pa, while I know…” when he was attacked by the bee. He stumbled over his words and joked “That bee really got me”. He pointed at where the bee had been and the crowd erupted with laughter – while Meghan could not stop herself giggling and put her hand to her mouth. Charles had a close encounter with a bee during a tour of New Zealand in 2015, when it flew up his double-breasted suit jacket during a visit to the Orokonui Ecosanctuary, near Dunedin. After a few tricky seconds the heir to the throne managed to dislodge it and in relief roared with laughter.